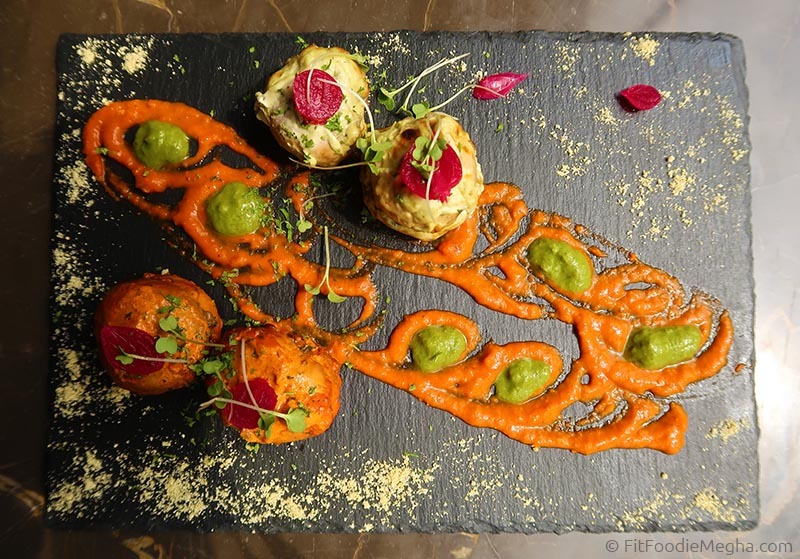 Fit Foodie Megha: Farzi Cafe, Jaipur – Introduction of the Molecular Gastronomy to the city! — Reviewed! Farzi Cafe, Jaipur – Introduction of the Molecular Gastronomy to the city! — Reviewed! 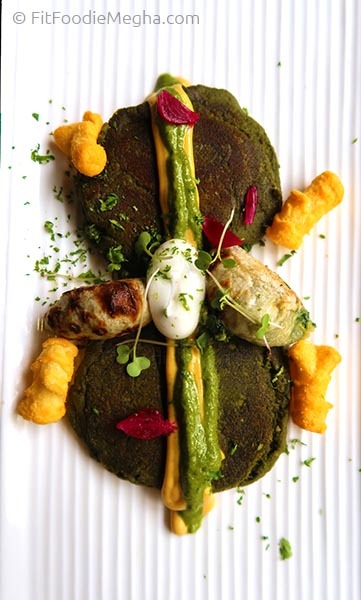 Farzi Cafe is a pioneer in molecular gastronomy. Being there multiple times and they never cease to amaze me with the illusion of creating culinary skills. After my first visit to Farzi Cafe, Pune, I was pretty excited to try the one in Jaipur. So, on my recent trip, I made sure to visit the fabulous place in the heart of the city. Started our meal with the signature amuse bouche. The mango based palate cleanser was presented dramatically and was a fun way to begin the culinary journey. Crunchy from outside and soft, gooey, cheesy from inside is what defines our first appetizer – Mac and Cheese Pakora Bites. Served with the scrumptious potato wedges and special spicy dip, the pakora bites were a delight to eat. We coupled it with the famous mocktail – Apple Foamtini. The dramatic presentation and the taste of it was worth trying. The freshness of mint and the taste of green apple was evident. Never ever thought Jackfruit would be used so creatively in cooking. The indulgent dish – Jackfruit Cigars, might taste like meat but don't be fooled by its texture. The healthy crushed mock-meat jackfruit is stuffed in the savory pastry sheets and fried to perfection. Loved the crunch of it. Delicious. Another awesome and surprise was the recreation of Punjabi traditional recipe – Sarso ka Saag in the form of Galavat. The melt in mouth sarson ke saag tikkis/patties/galavat was served with the corn kulcha and buttermilk spheres. The burst in mouth spheres was too yum. Overall, each element was worth a try. Tempered Palak Paneer Malabari Parantha Quesadillas was next on the table. Palak paneer was layered between the bite-sized parantha shaped quesadillas topped with the chunks of pickled onions. It was a filling meal in itself. Desi food with a twist! Lesser could we imagine to burrp the Golgappa Platter in a posh restaurant. The platter had spiced and non-spiced potatoes, peas, namkeen paired with sweet and spicy water with sooji puris. 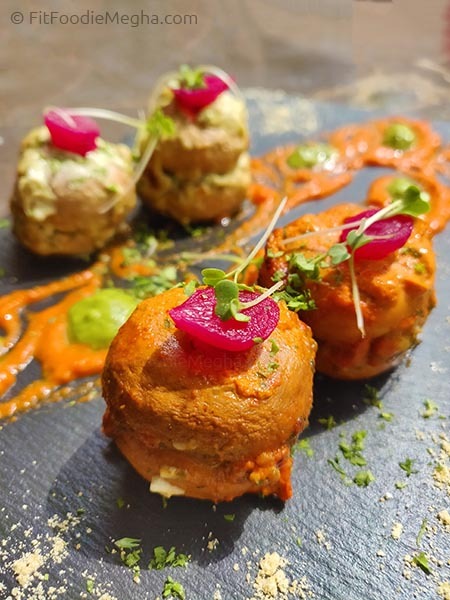 customize your own gol gappas as per the palate. I loved every bit of the stuffing and the balance of taste of water. A must have in there. It is definitely steeply priced but worth it! Mushrooms lovers should definitely try Duo of Stuffed Mushrooms Kebabs. They were prepared in two marinations with a distinctive taste. Juicy Mushrooms were delicious as ever! Dal Makhani and Brown Garlic Naan were a symphony of flavors. The creamy froth over Dal Makhani not only made it look gorgeous but took the taste of it to the next level. The smooth, velvety texture with smoky aroma was to die for. Paired with scrumptious Garlic Naan, this is one of the must-try dishes at Farzi! On a sweet note, we ordered Dirt Pile. Literally, it was death by chocolate. Everything chocolatey right from dense brownies to perfectly made chocolate dust, chocolate syrup! So So heavenly! Highly Recommended. And the end of the meal was magical too! Candy Floss Paan Gujhiya was the mouth freshner presented in the wooden box. Dehydrated Paan stuffing in candy floss coating, it is as light as feather and just melts in the mouth. Just WOW! Overall, Farzi Cafe is an interesting and innovative add-on to the Jaipur culinary scenes. I would definitely recommend everyone to visit them for a memorable experience. Padron Cigars https://www.gothamcigars.com/padron-cigars/ Love what you're doing here guys, keep it up!..